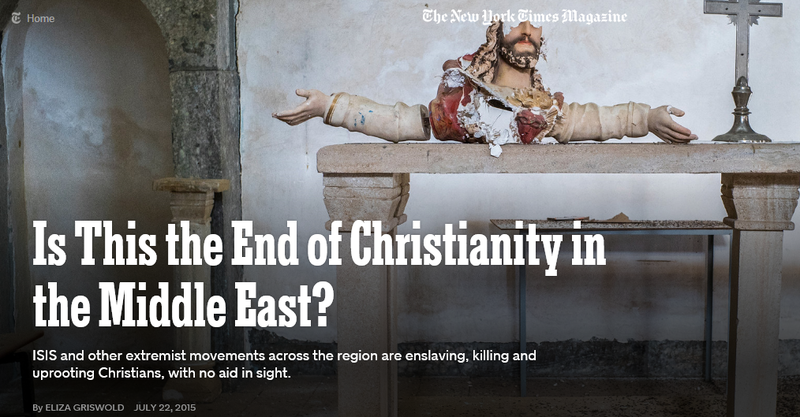 With ISIS on the rampage, “is this the end of Christianity in the Middle East?” So asks a must-read feature story in the New York Times. Why are ISIS jihadists are so blood-thirsty? Why do ISIS leaders want to establish an Islamic kingdom or caliphate? Are ISIS leaders are really serious about slaughtering and/or enslaving all of the Christians of the region, in addition to annihilating Jews and all Muslims who don’t subscribe to their theology or eschatology? What he discovers is evil beyond his worst nightmares — a Satanic movement determined to rob, kill and destroy everyone in its path, and particularly Christians. but no, this is not the end of Christianity in the epicenter — rather, this is the dawn of Christianity’s greatest waves of evangelism, conversion and discipleship. Even now, millions of Muslims are converting away from Islam and becoming truly devoted disciples of Jesus Christ, as I have written about in my non-fiction book, Inside The Revolution, and in blog columns like this one. I’ll discuss this more at the August 6th event I’ll be speaking at in Denver. (please click here to register). The darkest headlines I have read in years. Earlier this week, I flew back to the U.S. from Israel for several speaking engagements. In the coming days, I speak (and blog) about the crumbling U.S.-Israel alliance, the Iran nuclear alliance, the horrific advance of the Islamic State across Syria and Iraq, and what happens to America, Israel and the nations of the Middle East according to Bible prophecy. But I need to draw your attention to some of the most troubling headlines I have seen in years. The news in the Middle East is dark and getting darker, to be sure. But the headlines here in America are getting very dark as well — mass shootings around the nation, the slaughter of nine Christians inside the black church in Charleston, the 12 shot in a Louisiana movie theater, and four Marines gunned down in Chattanooga, all of which happened in July alone; Planned Parenthood executives caught discussing how best to sell hearts, lungs and brains from aborted babies; and now the unveiling of a sculpture of Satan in Detroit in what is being promoted as the largest public Satanic ceremony in American history. No, this is not fiction. These are not plots of my future novels. This is all happening across America this month. I am absolutely sickened by these videos in which Planned Parenthood executives discuss — so coldly, so cruelly — the selling of human body parts over a lunch of salad and wine. Have you watched the videos? Please do, and please share them with others. People need to know the truth. The mainstream media is giving some coverage to the story, but not nearly enough. This is sick. This is barbaric. This is the stuff of Dr. Mengele and the Nazis, and it isn’t happening on the other side of the world in Auschwitz; it is happening right in America every day. Planned Parenthood is an organization that kills more than 300,000 babies in the womb every year. It also receives more than a half-billion dollars a year of federal money — that’s right, your taxpayer dollars and mine. Congress should immediately cut off all taxpayer funds to the group. PP should be investigated for criminal activity (it is illegal to sell body parts for profit). Congress should also immediately pass pending legislation to ban abortion after 20 weeks. And pro-life legislators and activists in Washington, D.C. and the States need to make a new push to end abortion once and for all in this nation. Since 1973, more than 57 million babies have been aborted in this country. Their innocent blood is crying from the ground for justice, and God is listening. If we do not plead for His forgiveness and turn this thing around, judgment is coming. The Satanic Temple has said Saturday’s private event will be open only to people with tickets, $25 each. Invitations to “The Unveiling” summoned guests to prepare for “a night of chaos, noise, and debauchery… Come dance with the Devil and experience history in the making.” The event location is not being announced publicly and is known only to those with tickets. Photography is strictly prohibited at the 18-and-older event unless, of course, you’re a $75 VIP ticket holder. Those partygoers will have an exclusive opportunity to be photographed seated on the Baphomet monument…..
Detroit was ultimately selected for the unveiling because The Satanic Temple in the city has a “strong congregation,” with more than 200 registered members…. It is sobering how rapidly evil is rising in this country, how brazen, how public. We need to humble ourselves. We need to get on our knees. We need to seek Christ’s forgiveness and His mercy on this country. We need to do it now, or we will face the consequences foretold in the Bible thousands of years ago. Is the Obama administration preparing to “divorce” Israel? I’ll address this and other questions in Denver on August 6th. “Israel, Iran & ISIS: What’s next?” Register now to attend. (Denver, Colorado) — A terrible darkness is descending upon the people of the Middle East. The forces of evil are on the march. The forces of freedom seem to be in retreat. And people in the region, in the U.S., and around the world are asking sobering and increasingly urgent questions. Is a new and terrible war coming to the epicenter soon? Is the Obama administration preparing to “divorce” Israel? 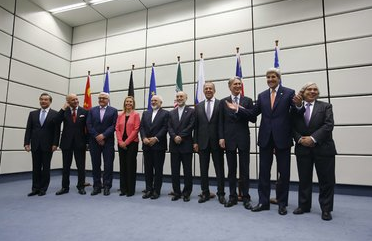 What exactly are the details of the recent nuclear deal with Iran? Will the deal bring about regional stability as its supporters contend, or accelerate the path to war as its detractors fear? Why are Iranian leaders euphoric about the deal and Israeli and Sunni Arab leaders so deeply concerned? Have the U.S. and the Western powers halted the ISIS onslaught in the Middle East, or is ISIS continuing to take more and more territory and kill and terrorize more and more people? How vulnerable are nations like Jordan, Egypt and Saudi Arabia to the Islamic State? What role does Islamic eschatology play in motivating the leaders of Iran and ISIS? How are followers of Jesus in the epicenter faring amidst all the current turmoil, and how can Christians in the West pray for them, support them and encourage them in these dangerous times? On Thursday evening, August 6th, I’ll address these issues at an event in the Denver, Colorado area. The topic of my address will be, “Israel, Iran & ISIS — What’s Next?” I hope you will join us. The occasion will be the annual fundraising event for Ministry Architecture, Inc. This is the ministry that my parents (Len and Mary Rosenberg) started around 15 years ago. It provides architectural services at no charge to evangelical Christian ministries operating in developing countries who need orphanages, training centers, medical missionary hospitals, and other facilities to show and share the love of Jesus. Before I speak, my folks will share a bit about the exciting work God is doing through this ministry in various parties of the world, including Africa and Asia. Then I will discuss the latest developments in the epicenter and take your questions. The event will take place at Calvary Chapel South Denver in Littleton, Colorado, from 7:00pm to 9:15pm. Doors will open at 6:15pm. A contribution of $25 per person is requested to help support Ministry Architecture. Contributions are tax deductible. Registration is required, and you can register at www.ministryarchitecture.com. Please join us — I hope to see you there. Netanyahu tells Steve Forbes the prospect for “worst kind of war” with Iran is growing because of nuclear deal. Polls show 47% of Israelis now support a unilateral strike. Prime Minister Netanyahu speaks to Forbes magazine editor-in-chief Steve Forbes. (Central Israel) — Are Israeli leaders actively considering preemptive military strikes to neutralize Iran’s nuclear threat, now that the world powers have struck a deal that gives Iran nearly everything it wants and puts Tehran on a legal pathway to The Bomb? I was asked this last night during an interview on an American radio program. The host knew that I had once worked for Netanyahu, and that I stay in touch with his team and other Israeli national security experts. He also knew that I had written a series of political thrillers several years ago — The Twelfth Imam, The Tehran Initiative and Damascus Countdown — that imagined what might happen if an Israeli prime minister ordered such an attack, despite pressure from an American president not to do so. First, let me be clear: I have no inside knowledge of what Israeli leaders are preparing to do. I haven’t spoken to Mr. Netanyahu in quite some time. Indeed, having just returned to Israel on Tuesday, I haven’t been in contact with any Israeli officials yet so I’m only sharing my own personal thoughts and observations. Israel has used surprise military force twice to neutralize foreign nuclear programs. In 1981, the Israeli Air Force attacked and destroyed Iraq’s nuclear facilities. Then in 2007, the Israelis attacked and destroyed a Syrian nuclear facility being built with the help of the North Koreans. An attack on Iran’s facilities would be far more complex, and the possible retaliatory blowback could be horrendous. But yet, the Israelis certainly have the capability to do what they need to do, and they’ve been preparing for years for that moment. Given Israel’s historic track record, it is possible Israeli leaders will come to the point of feeling they have no choice but to launch attacks on Iran. I am certain Israel’s leaders want to find every possible avenue short of war. They certainly would like to see Congress derail this dangerous — indeed, insane — nuclear deal that gives Iran everything they want and more. This will be the first focus. The Israelis could also potentially use covert means to sabotage or slow down Iran’s pursuit of The Bomb. Meanwhile, the Israelis are quietly working with the Saudis and others Sunni Arab states to figure out ways to neutralize the Iran threat short of war, if at all possible. That said, support for war is rising here. The latest polls indicate that 74% of Israelis say this deal won’t stop Iran from getting The Bomb, and 47% of Israelis now support unilateral strikes against Iran, if need be, while only 35% oppose such strikes. What’s more, Prime Minister Netanyahu gave an interview to my old boss, Steve Forbes, indicating that the prospect of war — including a “nuclear war” — has just become much more likely because of this deal. You will find the full text of the interview (and a link to the video) below. I would encourage you to read it and study it carefully. Please be praying for peace, praying for wisdom for Israeli and other regional leaders, pray for Congressional leaders to do the right thing, and keep praying for President Obama and his team, as well, that their hearts and actions might be dramatically changed and soon. STEVE FORBES: Prime Minister, President Obama has said that if there isn’t a deal with Iran it will mean war. What we’ve learned about the deal is not reassuring. What’s your take on this? BENJAMIN NETANYAHU: I think if the deal goes through we’re in danger of war, and it might be the worst kind of war we can imagine. Because this deal will open the way for Iran not to get a bomb but many bombs. Within a decade it will be free to enrich uranium on an unlimited basis. And it will be able to make the fissile core for dozens of bombs–indeed, hundreds of bombs–which it can then put on the hundreds of ICBMs it already has. Under this deal Iran is going to get $100 billion to $300 billion, which it will be able to use to fund its terrorism and its aggression in the region–its aim being to destroy Israel. Given Iran’s history of aggression, I’d say that this double bonanza of a guaranteed pathway to a nuclear arsenal and a jackpot of money to continue its aggression actually makes the danger of war, even nuclear war, a lot greater. SF: You make a very important point. Even if Iran sticks to the deal, which is highly problematical, in a decade it will be a major global nuclear power, and it will have ballistic missiles. BN: Iran is producing them, and guess what? Within a few years they will be able to reach the Eastern seaboard of the United States. And then every point in the United States. But this deal will also enable Iran to tip those missiles with nuclear weapons, with atomic bombs. And I think it’s a huge mistake to allow the foremost sponsor of terrorism in the world, Iran, to have nuclear weapons, as well as the capacity to give such weapons to its terrorist surrogates. This is a big, big mistake. Not only endangering Israel and the entire Middle East but the entire world, specifically the United States. The mullahs, the dictators in Tehran, they call us the little Satan; they call America the big Satan. You are their ultimate target, and you should not give such a terrorist regime the weapons of mass destruction. Because I think the greatest danger facing our world is the marriage of militant Islam with nuclear weapons. Here you have a militant Islamic state, Iran, arming itself with nuclear weapons and receiving a huge cash bonanza in the bargain. That’s a mistake. SF: The prospect of Iran becoming a nuclear power is going to set off a nuclear arms race in this part of the world, is it not? BN: It is. The greatest danger in this deal is not that Iran will violate the agreement. That’s a danger — and it’s probably a certainty, given its record of cheating. The fact is that within ten years Iran won’t have to violate anything; it can just walk into the bombs. Into many bombs. The Iranians are openly saying that they won’t have the 6,000 centrifuges they’re allowed under this deal, they can have 190,000 centrifuges. Which is a vast amount. They’ll be able to take yellow cake, put it into those centrifuges, spin it and make the material needed for nuclear bombs within weeks–and on a vast scale. And they don’t have to violate the agreement. They merely have to keep it to get a nuclear arsenal. And that’s why countries in the region — Iran’s Arab neighbors and others — are saying, “Well, if Iran is going to be given a license to produce an atomic bomb arsenal, then we have to do that, too.” So this deal will spark a nuclear arms race in the Middle East tinderbox. And, you know, this could be the deal that will be the ultimate nuclear proliferator, that more than anything else in history will cause the proliferation of nuclear weapons. That’s bad news for everyone. SF: Iran clearly wants to become the dominant power in the Middle East. We see its proxies operating everywhere. Iran seems, ultimately, to have its eyes on Saudi Arabia’s oil, not to mention Iraq’s. BN: And the holy places. SF: And the holy places. Putting aside the nuclear issue, how do we counter Iran’s ambitions in the region, which have global implications? BN: Well, don’t give Iran the $100 billion to $300 billion to fund its proxies and its own arms industry–its rockets, its drones and its submarines. Why give the most dangerous regime on Earth the power to further its aggression? This is a big, big mistake. So, the first thing is: Don’t give Iran the funds to multiply its aggression 10 times, 100 times over. Second, resist Iran and its proxies. Support your allies, support those who are resisting Iran. And the principal ally, the best ally that the U.S. has in this region is Israel. I think that America has no better friend than Israel, and Israel has no better friend than America. And we should stand together against Iranian aggression, and against ISIS’ aggression. Both of them are our enemies. You shouldn’t strengthen one and weaken the other; you should weaken both. SF: What happens if Congress doesn’t derail this deal? BN: We always have the right and the duty to protect ourselves against a regime that, while denying the Holocaust, is planning another Holocaust against the six million Jews of Israel. That will not happen. We won’t let it happen. SF: Is this like the 1930s? BN: No, it’s worse, because we have the example of the 1930s, which wasn’t available then. Saudi Prince Bandar is publicly blasting the deal with Iran as worse than the nuclear deal with North Korea. Sunni Arab leaders throughout the Middle East are aghast by the insane nuclear deal President Obama and the P5+1 powers have struck with Iran. Many Sunni Arab leaders feel deeply threatened by a resurgent and increasingly violent Iranian government. Egyptian, Jordanian, and Gulf leaders are privately stunned and angered by the recent moves of the Obama administration, especially with regards to Iran, yet they have also been cautious in their public comments. The Saudis are a different story. As I have reported in the past, the Saudis have been quietly working with the Sunni leadership of Pakistan to potentially buy nuclear warheads from the Paks if the world community didn’t find a way to cut off Iran’s pathway to The Bomb. What’s more, as I have also reported on this blog, the Saudis have been quietly cooperating with Israel in recent years on contingency plans for a potential preemptive military strike on Iran’s nuclear facilities, should all peaceful options prove fruitless. Now, in a highly rare development from an ally that almost never publicly criticizes the American government, one of Saudi Arabia’s most senior and respected leaders has chosen to publicly blast the Iran nuclear deal. 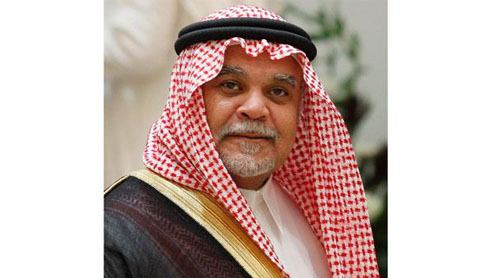 Writing a letter to the Washington Post from the Saudi capital of Riyadh, Bandar Bin Sultan Bin Abdulaziz Al-Saud (widely known as Prince Bandar) — the Saudi ambassador to the U.S. from 1981 to 2005 — warns that the current deal with Iran is far worse than the U.S. deal with North Korea which led to the Pyongyang building and testing nuclear warheads. There is a real opportunity here for the next American president. A leader who knew what he was doing could rescind and repudiate this dangerous deal with Iran upon taking office in January 2017. He could also set about to work closely with this quiet but real emerging alliance between Israel and several Sunni Arab powers to seriously and effectively confront not only the Iran nuclear threat but the growing ISIS threat to the region, as well. “Pundits are saying that President Obama’s Iran deal stirs deja vu of President Clinton’s 1994 North Korean nuclear deal. I humbly disagree. President Clinton made his decision based on a strategic foreign policy analysis, top-secret intelligence and a desire to save the people of North Korea from starvation induced by its leadership. “It turned out that the strategic foreign policy analysis was wrong. If Mr. Clinton had known about the major intelligence failure, he would have made a different decision. “Mr. Obama made his decision on the Iran nuclear deal aware that the strategic foreign policy analysis, the national intelligence information and intelligence from U.S. allies in the region predict a worse outcome than in North Korea — and Iran will have access to billions of dollars. 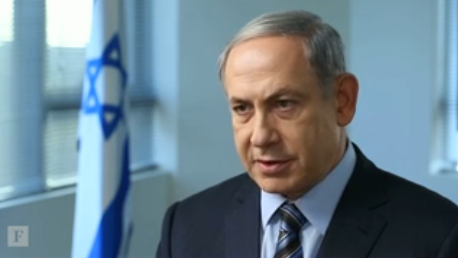 “This deal will wreak havoc in the Middle East, which is already a disastrous environment. Iran is a major player in the destabilization of the region. Iran’s president goes on TV to tell his nation Iran got everything it wanted from nuclear deal and much more. 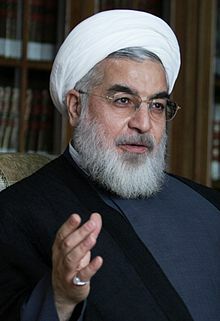 Iranian President Hassan Rouhani is publicly boasting how Iran got everything it wanted from the deal and much, much more. “Our objective was to have the nuclear program and have sanctions lifted. “At first they wanted us to have 100 centrifuges; now we will have 6,000. “They wanted restrictions of 25 years; now it’s 8. “First they said we could only have IR1 centrifuges, now we can have IR6, 7 and 8, advanced centrifuges. “[At first they said our] heavy water plant at Arak had to be dismantled; but now it will remain with heavy water under conditions. “[At first they said the nuclear facility at] Fordo had to be closed; now we will have 1,000 centrifuges there…. “In future days when UNSC comes with new resolution, all 6 of their previous resolutions will be lifted…. “Honorable Iranian nationals, all sanctions, including on missiles, will be lifted on days of implementation. Not suspended, lifted! “Today is the end of oppressive sanctions. The chain of sanctions is broken…. “Today people in Lebanon and Palestine are happy because Zionists have tried to block this deal but failed…. These remarks were reported via Twitter by Thomas Erdbrink, the New York Times’ correspondent in Tehran.